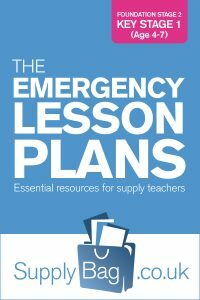 These emergency lesson plans for Year 1 and Year 2 science are only to be used by supply teachers who are faced with no planning or easily accessible resources. recording their work on a table. Floating and sinking: selection of items available – what will float? What will sink? Why do you think that? Complete activity and record results and why they are different/right. Plan and carry out investigation into shoe size/hand span, recording results on a graph. key words/sentences to explain why dead/alive. Draw the life cycle of a butterfly, labelling key parts. Discuss being healthy and get students to prepare a television commercial explaining some exercises/healthy food to be healthy. going to the toilet, before eating, after playing outside, brush teeth twice a day etc. Take students on a nature walk around the playground – what can they see? What can they hear? What can they smell? Students to identify what plants and animals are in their school environment. Classifying items – give each group a selection of different items and get them to classify them and then explain to the rest of the class what they have done and why. Identify different sources of light in the classroom. hear? What do they need to do to hear? Why are some sounds louder than others?